Environment is a devolved issue. The administrations of Westminster, Scotland, Wales and Northern Ireland all have diverging preferences on how environmental policies should be decided once the UK leaves the EU and how ambitious they should be. Can a new governance framework be created once the UK leaves the EU that is accepted by all four nations and effectively delivers policy goals? Leaving the EU raises many legal questions. The Government has committed to ‘cutting and pasting’ EU environmental rules into UK law via the EU Withdrawal Bill to prevent regulatory holes emerging when the UK leaves. However, can every part of EU law be copied into UK law, for example in cases where it makes reference to EU institutions? Another concern is that the UK lacks the capacity to develop, implement and enforce environmental policy, tasks that have until now largely been carried out at the EU level. Lastly, without recourse to the Court of Justice of the EU, how will NGOs ensure the government implements its environmental policy outside the EU, and thus hold ministers to account? Any trade agreement decided between the UK and the EU, and between the UK and other countries, will have significant implications for the environment. The EU is keen to ensure that the UK maintains EU standards and does not become ‘the dirty man of Europe’ again. Trade deals with other countries such as the US, however, raise concerns of lowering environmental standards. Any future trade agreement will also have implications for associated sectors, such as agriculture and food, which are dependent upon access to migrant workers, have supply chains that operate across borders and whose profitability currently relies upon EU exports and imports. Brexit has the potential to impact both UK and EU climate change policy. The UK has traditionally been a supporter of more ambitious climate policy and Brexit could conceivably weaken the EU’s progress. In the UK, however, there are concerns that Brexit negotiations will divert attention from climate change and that the lack of external pressure from the EU will allow the government to weaken climate regulations. The EU’s flagship nature protection rules (the Birds Directive and the Habitats Directive) will not apply in the UK even under the softest form of Brexit (the Norway option). This raises questions about the future of the Natura 2000 network of European designated sites in the UK, about the protection for habitats in planning applications and about international collaboration on halting biodiversity loss. Air pollution across Europe is firmly on the policy agenda, with many European countries failing to meet EU standards for air pollution. Air pollution is a transboundary problem – pollution in one country can have negative impacts in another, as was the case with acid rain in the 1970s. This raises questions of future collaboration between the UK and the EU on reducing air pollution. Air pollution is also at the heart of a legal battle between the environmental group ClientEarth and the UK Government. This battle hinges on the binding nature of current EU rules, raising questions about the ability of civil society to hold the government to account after Brexit. EU waste legislation has been central in shifting UK policy from landfilling most waste to ensuring more waste reduction, recovery and recycling. International trade in waste (to ensure that it can be disposed of in the most efficient and environmentally friendly way) will need to be considered in creating future waste policy. The ways in which waste policy is shaped will affect both the waste sector that earns revenues from handling waste, and businesses that are required to take responsibility for waste issues created by their products. 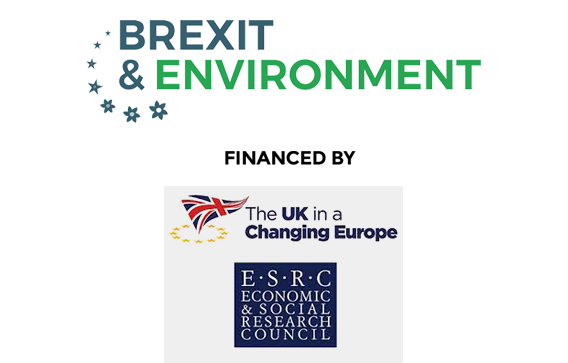 Key questions include whether the UK will maintain EU waste standards; whether the UK’s waste policies will weaken when we leave; or whether leaving the EU incentivises new and more ambitious waste policies. Brexit raises questions regarding the UK energy mix as well as UK participation in the broader EU energy market. A government decision to leave Euratom will make it more difficult for the UK nuclear energy sector to develop further, while leaving the EU could free the UK from renewable energy and energy efficiency targets. Leaving the EU means leaving the Common Agricultural Policy (CAP). Brexit provides an opportunity to rethink current policy and possibly make it more efficient and sustainable. Leaving the CAP will also pose challenges, however. Agriculture is a devolved issue, yet it is the UK administration that will negotiate Brexit and future trade deals, which will have a significant impact on devolved agricultural and environmental policies. The mismatch of priorities and objectives between nations might lead to political conflict. Moreover, the financial support currently provided by CAP is critical for some farmers, particularly in the devolved nations. Meeting EU process and product standards will be a requirement for UK farmers to access the EU market. If the Brexit negotiations end with a ‘no deal’ outcome, however, the UK will have to work under WTO rules. This may open up UK agricultural markets to new competition, drive some farms out of business and pressure the government to weaken environmental and animal welfare standards. Brexit means leaving the Common Fisheries Policy. This offers the opportunity to rethink and improve fisheries policy in the UK to make it more sustainable. Fish stocks move across borders, however, so the UK will still need to cooperate with the EU in some way to ensure the sustainable management of our marine resources. Future trade agreements with the EU and other countries will affect both the marine environment and profits, employment and rural development in fishing communities. There is also a risk that leaving the EU will weaken existing environmental protections and enforcement of fisheries and conservation regulations due to a lack of civil service capacity.